This project is a car dealership located in Houston. The contractor poured 22 yards 4500 psi concrete to expand the interior floor, giving the dealership more sales area and showroom space. Then they used a self-leveling underlayment up to 1/2 inch due to the expansion of the interior of the building floor, raising the overall floor to level. A micro-top overlay was then applied over the entire area to get a consistent canvas for the finished floor. Ameripolish Dye with a base coat of Gold and a top coat of Walnut was used for the coloring. Finally, a primer coat followed by two top coats of water base polyurethane for a durable and long lasting finish coat was applied. This project was performed for Colonial Harley Davidson in Colonial Heights, VA. The contractor started out by removing the tile from the floors in the service department area. 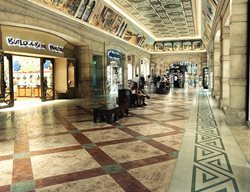 They then broadcast sand onto the floor surface to grind the mastic off the floors with a HTC 800 grinder and 80 grit metal bond diamonds. Next, they proceeded with 120 grit metals, then installed Scofield densifier, and proceeded up to 400 grit resin diamonds. The floor was then cleaned with an auto scrubber for preparation for the installation of H&C Spanish Dagger acetone dye. After the dye was installed the floors were polished up to 1500 grit and DCI polish guard applied. 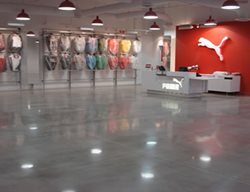 In a sport shop in downtown Bucharest, three layers of microtopping were used to create a unique flooring effect. Amber and turqoise acid stains add vibrant color. Decorative concrete is a good option for gym flooring. 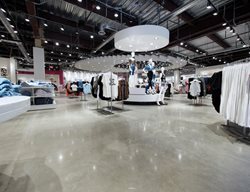 Learn more about retail floors. Increte Systems Stain-Crete was used at this Raising Canes location. This beautiful resort hotel features daily weddings and banquet events for any occasion, but when the resort’s interior carpet was damaged due to flooding and mildew, the owners had to think fast to fix the problem. Concrete by Design was contacted and began removing old carpet and glue residue to prepare for an overlay. The design for this project was inspired by local artist Lex Master of Atlanta, GA to accent the property’s high-end luxury appearance. By the end of the project, the resort’s wedding and banquet reservations were increasing. Now the resort's main attraction is the elegant custom pool deck, which meets expectations for any important event. 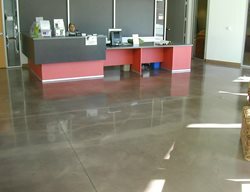 Metallic-pigmented epoxy transformed the floor of an oral surgery center. 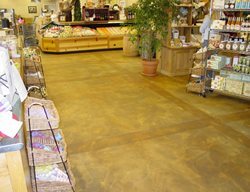 Read about this epoxy floor. Stained floor at Hot Rod Bar and Grill uses black stain by Kemiko and flames in English Red stain around the bar. The deck of the USS Midway had a very damaged and uneven surface. The steel deck was installed using Westcoat’s epoxy slurry filler to level the area, then Westcoat EC-31 was applied to fill and slope additional sections. To beautify the surface, two coats of EC-95 with an iridescent metallic additive were applied, followed by acetone splashed onto the surface while still wet to achieve a unique glistening epoxy finish. Varsity Sports Bar in Chicago received an inexpensive, low maintenance, and beautiful floor. A layer of diluted black acid stain was applied to the whole floor, then the pattern was taped off and a second layer applied. 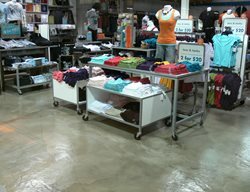 Commercial flooring - colored and diamond polished concrete flooring. MicroTopping with Caramel acid stain and a zylene based sealer. This concrete flooring in the food prep area of Ricker Dining Hall at Stanford University is both attractive and functional. 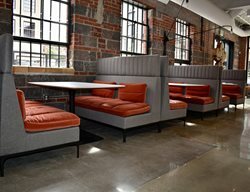 Concrete is easy to maintain and clean, making it a good choice for a kitchen or restaurant setting. 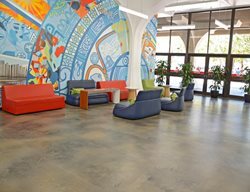 Ricker Dining Hall at Stanford University recently got a face lift with new colored concrete floors. 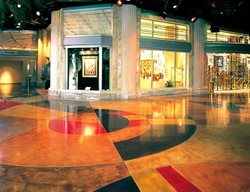 Decorative concrete used as the flooring choice in the food court of Philadelphia Premium Outlets™. 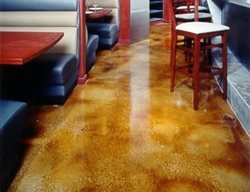 LM Scofield’s Lithochrome Chemstain was used for this concrete floor at the Roadrunner Bar and Grill. The design was scored and a polymer overlay was then stained on the concrete. The floor was sealed with a water-based polyurethane sealer, along with two coats of a maintenance wax.